Jun 21st, Jun 22nd, Oct 11th, Oct 12th, Oct 18th, Oct 19th, Nov 1st, Nov 2nd, Nov 8th and Nov 9th. Cost of Course: £159 per rod per day. Maximum of 3 rods per day. The Farlows Group has once again teamed up with David Wolsoncroft-Dodds to introduce you to some of the most exciting fly fishing in the UK – pike on the fly! 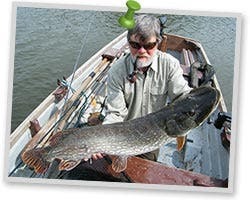 David’s expert knowledge and understanding of fly fishing for pike is unsurpassed. His book, ‘Fly-fishing for Pike’, was published in 2010 and he is widely regarded as one of the key authorities on the subject in the country. With his relaxed but informative approach, you will enjoy a great day and leave with a wealth of pike fishing knowledge and maybe, just maybe, you’ll land a huge pike as well! Bowood’s beautiful lake is home to some splendid, heavyweight pike. It is a private lake set in parkland sculpted and landscaped by Capability Brown and has been home to the Lansdowne family since 1754. It is an idyllic setting in which to enjoy some very special fishing. Over the years, Bowood has consistently produced specimen pike and with an abundance of prey fish and little in the way of angling pressure the species thrive. Meet at Bowood House Hotel, Derry Hill, Calne, Wiltshire SN119PQ at 8.45am for a splendid breakfast and introductions before decamping to the lake and the boathouse. Flies that catch pike – with a tying demonstration. Properly balanced tackle – tackle can be provided to participants. Equipment such as landing nets, unhooking mats, unhooking tools, echo sounders, outboard motors etc. Fishing techniques specific to pike, such as fly retrieves and strip striking. Boat management and boat fishing techniques. Unhooking pike while retaining a full complement of fingers! There will be opportunities to fish from both the bank and from a boat, it’s more than likely that some pike will be caught and there is always the chance of catching a real Bowood heavyweight. PLEASE NOTE: We have put on two extra days this year to meet demand, so book early to avoid disappointment. Please ensure you read our course terms and conditions prior to booking.